Here is a great PC Optimum points offer at Shoppers Drug Mart this week! 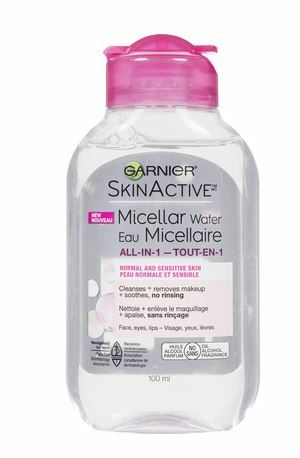 Garnier Micellar Water 100ml, priced at $3.49, also happens to have a bonus of 3000 PC Optimum points this week. This makes it just 49 cents after factoring in the value of the points, and if you include it as part of your 20x shop today, it becomes a money maker. There are two varieties of the 100ml Garnier Micellar Water, the pink one pictured is the one for normal and sensitive skin. These will likely sell out quickly so your store may already be out of stock, but do have a look just in case! Also, check your personal PC offers for any that may include Garnier skin care. Once you have purchased these products it’s very common to keep getting offers for them. While the 20x the points for today is also available online, this product is already sold out there, so your only option is to find it in store. Click here to view this product online at Shoppers Drug Mart Beauty Boutique. Where did you find the product 100ml for $3.49? My SDM had it for $11.49! The 100ml is in the travel section. The ones you are looking at priced at $11 and $11.49 are the 400ml bottles down the regular aisle.